Bruce Lee was an exceptional human with an awesome outlook on life. I love his passion for life and continued pursuit of excellence in regards to martial arts. 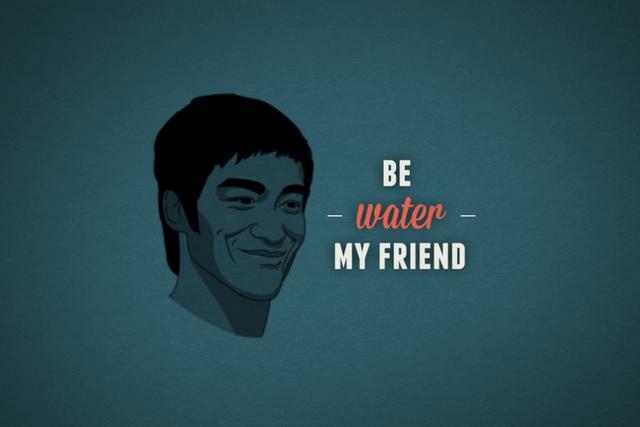 Bruce Lee reminded us to "be water, my friend." I tried to breakdown what Bruce meant and I think he is referring to having the ability to adapt to any situation. Life is unpredictable and we will deal with life ills and moments of tranquility. I found a great answer from Conor Neill. Conor Neill suggests that being water refers to a Tao concept called Wu Wei - knowing when to act and when not to act. Another website that I visited suggested that be like water refers to having faith like flowing water. The Endless Further expands on this concept suggesting that life requires faith like this. To be like water. There are times when flowing water meets turbulence, but after the rapids, there is a return to a calmer flow. In another life I would love to have a conversation with Bruce Lee. What does "be water, my friend" mean to you? I would love to read your response in the comments section below. PS: The feedback on this post has been phenomenal. Google+ is awesome!